No gardener can ever be perfectionist! Suppose if you were - The shrubs in your garden grew too big quickly, no unwelcome bugs were there to dine on the feast, flowers bloomed round the year. What more can you expect? But a passionate gardener would never cease to get everything in the garden at just right place. Here are some tricky little gardening tips that will make your landscape appear near to perfection. Who says your garden is messy? If it is, be thankful because you have much more to experiment with your creativity. The solution is much simpler. Sweep and rake the all the path to define the edges distinctively. Mow the lawns and cut the edges of the grass properly. Define the path with edging materials such as stones, bricks, logs or anything that compliments your garden. Accessorize...now what's that? It simply means to introduce an element of fun and style to your garden. You can use garden accessories in hundreds of creative way. Surprisingly with or without plant. Beautiful garden urns make a real style statement, especially one with a weathered mossy patina. You can also use garden decoratives such as bird bath, statues, plant shades and lightening. Garden furniture can also add a wonderful visual appeal to the space. What makes things distinctive, of course the appearance. Contrast makes life interesting and same is with your landscape. Design your garden - think of broad and narrow leaves, blobby and spiky for shapes. A mix of seasonal and evergreen will keep your garden at its bloom. You can also grow some feathery perennials next to the daddy trunks. You may sometimes confused when to put compost underneath the roses? Answer is much simpler, when its free. Take a heap of free load of rotted manure and spread it. Use watering cans or automatic garden watering systems to shower the plant. Always be patient, just give your plants enough time to shape your imagination. 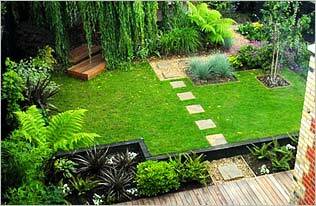 So, just step-up with the above garden design ideas to celebrate your style and make a bold announcement with the artistic streak.